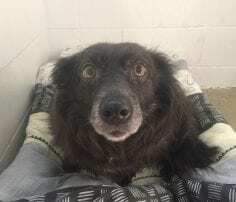 Kamloops and District BC SPCA staff are hoping the public can help a friendly dog found wandering behind the fire evacuation line near Kamloops as a stray. 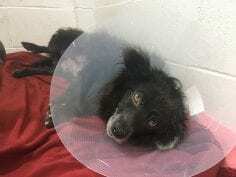 Badger, a six-year-old border collie-corgi mix, has multiple tumours along both mammary glands and an umbilical hernia. “This sweet girl has had so many puppies that her stomach is covered in tumours,” says BC SPCA Kamloops and District Branch manager Alyssa Kyllo. The medical costs associated with Badger’s surgery and care are estimated to be more than $3,000. The surgery is quite intensive and has to be split into two procedures. A non-profit organization, the BC SPCA relies primarily on public donations to help the province’s most vulnerable animals. With wildfires still burning in the province and evacuation or high-alert areas still in effect, 23 special provincial constables and other BC SPCA staff and volunteers from across the province are still busy on the frontlines working to reunite animals with their guardians and to feed and water animals left behind. Badger will be available for adoption once her surgeries and recovery are complete. If you can help Badger and other animals like her in need at the Kamloops SPCA, visit spca.bc.ca/medicalemergency or you can donate in person at 1211 8th St., Kamloops.